Set in the South Tyrolean Dolomites in Italy are an astounding pair of vacation rentals called the Mirror Houses. Designed by Peter Pichler Architecture, the two one-bedroom luxury rentals enjoy sweeping views of surrounding vineyards and the mountains. The units mirror each other in plan, and literal mirrors on the backside reflect the landscape back. Plus, the homes are built to Italian CasaClima sustainable construction standards with loads of daylighting, natural ventilation, and high-performance envelopes. The owners of the property live in a farmhouse built in the 60s, and they wanted to make use of their amazing site by adding vacation rentals. They hired Peter Pichler to design and build two luxury vacation rentals that provide privacy for both the guests and the owners. Each apartment was built to be fully autonomous and allow guests to experience nature. The units are both one bedroom apartments with open living and dining areas, and there is a basement storage area located beneath the residences. To minimize the impact on the view from the owner’s home, the back of the guest apartments are clad in mirrors, which reflect back the landscape and camouflage the building. The guests have spacious open views of the landscape through large windows pinched by the sweeping roofline. Daylighting and natural ventilation help minimize energy use while providing the guests with a closer connection to the outdoors. In addition, the luxury rentals were built to CasaClima sustainable design standards and feature triple-paned windows, wood construction and high-performance insulation. 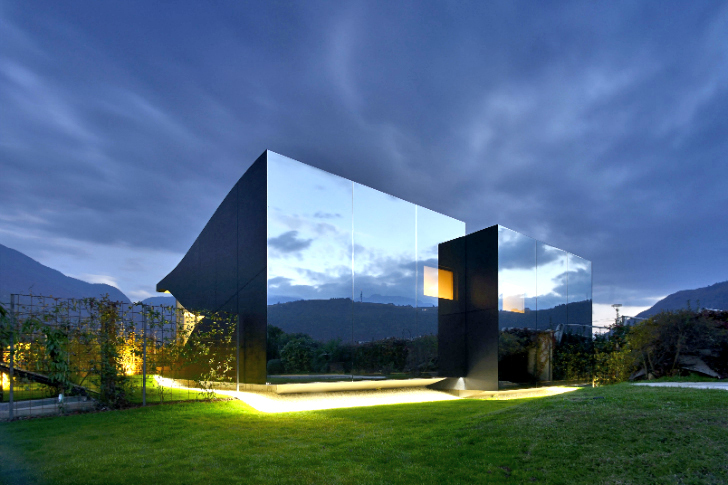 The Mirror Houses are located in Bolzano in the northern part of Italy. The two units accommodate 2-4 people each and are now available for rent starting at 150€ a night. Set in the South Tyrolean Dolomites in Italy are an astounding pair of vacation rentals called the Mirror Houses. Designed by Peter Pichler Architecture, the two one-bedroom luxury rentals enjoy sweeping views of surrounding vineyards and the mountains. The Mirror Houses are two luxury vacation rentals in northern Italy. The owners of the property live in a farmhouse built in the 60s and they wanted to make use of their amazing site with the addition of vacation rentals. They hired Peter Pichler to design and build two luxury vacation rentals that offered a maximum amount of privacy for both the guests as well as the owners. Each apartment was built to be fully autonomous and allow guests to experience nature. The units are both one bedroom apartments with an open space living and dining area, while under the units, there is a basement storage area. To minimize the impact on the view from the owner's home, the backside of the guest apartments are clad in mirrors, which reflect back the landscape and camouflage the building. The guests then have spacious open views of the landscape through large windows pinched by the sweeping roofline. Daylighting and natural ventilation help minimize energy use while allowing guests a closer connection to the outdoors. In addition, the luxury rentals were built to CasaClima sustainable design standards and feature triple paned windows, wood construction and high performance insulation. Each apartment comes equipped with all the necessary items needed along with WiFi and a washing machine. The units are located in the South Tyrolean Dolomites near Bolzano, Italy. Outside are views of the mountains along with a view into an apple orchard. Floorplan of the Mirror Houses.